How and why it helps us feel better and be mentally healthier. There is nothing touchy-feely or New Age-y about Dan Harris, an ABC News correspondent and Nightline anchor who has covered mass shootings, natural disasters and the war in Iraq. But an on-camera panic attack led Harris to discover mindfulness. Specifically, mindful meditation. And now he's a convert. Harris wrote a book called 10% Happier. And in case that sounds too touchy-feely he subtitled it: How I Tamed the Voice in My Head, Reduced Stress Without Losing My Edge and Found Self-Help That Really Works—a True Story. He now travels the globe extoling the virtues of mindfulness meditation. He says it changed his life and claims mindfulness can change your life and the lives of your kids, too. Mindfulness as we know it—and it's being tried out by everyone from elite athletes to corporate executives—was conceived as a therapeutic practice over 30 years ago by a scientist named Jon Kabat-Zinn. 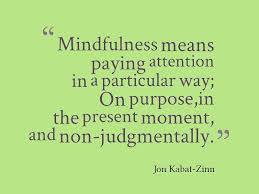 He defines mindfulness simply as "paying attention in a particular way: on purpose, in the present moment and non-judgmentally." That's the short version. To expand on that just a little, mindfulness is a meditation practice that begins with paying attention to breathing in order to focus on the here and now-not what might have been or what you're worried could be. The ultimate goal is to give you enough distance from disturbing thoughts and emotions to be able to observe them without immediately reacting to them. Harris has an appealingly pragmatic way of explaining mindfulness. "Mindfulness is the ability to see what's going in your head," Harris says, "combined with the ability to not get carried away with it." In the last few years mindfulness has emerged as a way of treating children and adolescents with conditions ranging from ADHD to anxiety, autism spectrum disorders, depression and stress. Dr. Allison Baker, a child and adolescent psychiatrist at the Child Mind Institute, says that mindfulness can play a significant role in managing anxious or negative thoughts. "It helps you step back and look at that thought as just a thought, as opposed to a reality," she says. "That in turn allows you to have a little distance and not necessarily engage in that thought and get agitated about it, or have your sleep disrupted because of it." Adolescents who practice mindfulness regularly develop that ability to self-regulate and put distance between the intensity of their emotions and the way in which they react to them—in particular how they engage in or react to negative, difficult or stressful thoughts. Acquiring that sense of self-control in itself is empowering, and it can help kids avoid unhealthy or dangerous responses. How is mindful meditation different from other kinds of meditation? The word "meditation" describes a wide variety of activities, many of which have little in common. "It's kind of like the using the term "sports," says Harris. "Badminton and water polo have nothing to do with each other. Meditation describes a whole range of activities, some of which are designed to boost your mindfulness muscle and others are not." Mindfulness involves paying close attention to whatever you are doing in the present moment—breathing, eating, brushing your teeth, feeling your feet on the ground and smelling the air if you're outside taking a walk. "Mindfulness," Harris says, can be achieved through meditation and it can be achieved by paying close attention to daily activities, "but in my opinion," he says, "meditation is the best way to get there." Harris doesn't pretend that meditation is the magic bullet that will solve all your problems. But there's a lot it can help with and it doesn't require a huge time commitment. In fact, Harris says, you can derive most of the benefits of mindfulness just by sitting quietly for even five to ten minutes a day, paying attention to your breathing and noticing the thoughts and feelings you experience. As your mind wanders—and you can expect your mind to wander constantly—you bring it back to the breath. That is what you're practicing. Mindfulness, Harris explains, "is mental exercise. You're trying to focus on one thing at a time—usually your breath. Then you get lost and you start over. And every time you start over, that is a bicep curl for your brain." How is mindfulness used clinically? Dr. Baker has increasingly incorporated mindfulness into her clinical practice for kids and adolescents with a variety of psychiatric diagnoses. It gives kids and parents the opportunity to put time and space between their emotions and their thoughts-between feeling and reacting. Dr. Baker says mindfulness can be used for a whole host of challenges, including attention and impulsivity issues, anxiety, depression, and PTSD, among others. The whole point of mindfulness is not to do away with particular thoughts, including negative ones, but to develop a different, non-judgmental relationship to them—to understand that they are feelings but they are notyou. In Dr. Baker's experience, parents and kids who practice mindfulness derive benefits regardless of their diagnosis. "Over time," Dr. Baker says, "it means that they then have choices about how they want to engage with or react to that thought and that's very powerful clinically because they actually feel that they have control. It really has incredible benefits in terms of their happiness, their ability to get a better night's sleep, their ability to not sweat a test. It's really powerful." How does mindfulness change your brain? Dr. Cameron Craddock, the Child Mind Institute's Director of Imaging, says studies on mindfulness have increased substantially in the last few years. "There's still a lot that we don't know about how it works, but what my research is showing is that there is a brain network, we call it the default network, that is constantly active when we have these ruminative or perseverative thoughts, thoughts that can be very deleterious." Rumination means compulsively focusing on bad feelings and experiences. And perseveration means repeating the same response over and over. Both of them are common symptoms of depression and anxiety among other psychiatric diagnoses. "This default network," Dr. Craddock notes, "is typically turned off when we are performing an external, goal-driven task. For example if you asked someone to do calculus, that network would turn off—hopefully. And what we've shown is that if that network doesn't stay off during the performance of that task you can't perform that task as well." Dr. Craddock says that when they first began to see this phenomenon, they thought of it as an attentional deficit. "Initially," he says, "it showed up a lot in ADHD and was attributed to attention. Now we're seeing it in major depression, we're seeing it in anxiety, in social anxiety, with PTSD, over and over again." It turns out that these intrusive, repetitive thoughts are looking more and more like an inability to regulate this default network in the brain. People who practice mindfulness regularly develop the ability to turn it off when they want to and turn it back on when they need to perform the tasks that require using it. "The key," he says, "is to be able to maintain the balance, and we're proving that mindfulness allows us to do that." Or as Dan Harris likes to put it, "Another way to think about it is getting out of your own way. It's hard to open a jar when every muscle in your arm is tight, and we are constantly doing the mental equivalent of that. We are constantly getting in our own way, tripping ourselves up with these thoughts." With mindfulness, he says, "They're going to continue to come, but you can develop a different relationship to them." Why practice mindfulness? Aside from the fact that if you're anxious or depressed, it's likely to make you less so, Harris says, "the reason to do it, for a beginner, is that most of the things that you're embarrassed by in your life are done out of mindlessness." Harris says mindlessness for him meant, "Going to war zones, coming home and getting depressed, not even knowing I was depressed, and then mindlessly self-medicating." For other people it may be starting arguments without thinking, constantly checking your phone when you should be paying attention to your kid or eating while watching TV. "What mindfulness does is act as kind of kryptonite for these impulses," Harris says. "So most of the time we're unaware of this nonstop conversation we're having with ourselves. And as a consequence, we're yanked around by it. Mindfulness, is just the ability to see what's going on in your head without getting carried away by it." Interestingly, Harris admits that mindfulness has also made him feel his feelings more acutely—even the negative ones. But he says that's not necessarily a bad thing. "There's a reason that they call feelings, feelings," he says. And that includes his initial response to things like anger. "You might notice that your chest is buzzing, your ears are turning red or whatever. And so for me in those moments of annoyance or anger the initial moment of suffering is actually more acute because I'm right there with it. But it's a good early warning system. I'm aware of what's happening and therefor there's a buffer between the immediate stimulus and my blind reaction to it." "Most meditation clichés make me want to put a pencil through my eye, but there is one cliché that I like, which is that mindfulness teaches you how to respond wisely instead of reacting blindly. That is a super power. It changes the whole game."